The Confederate navy’s addition of iron plates to the captured USS Merrimac steam frigate temporarily made it an unstoppable force in the disputed waters of the Civil War. 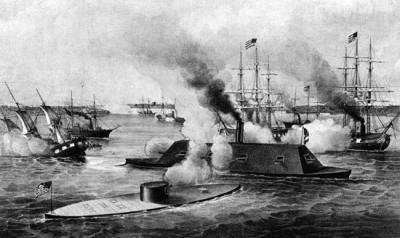 After seeing the Merrimac in action, the Union Navy constructed its ironclad, the USS Monitor. 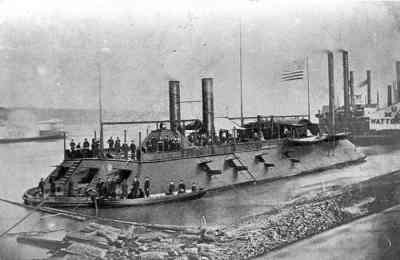 On March 8, 1862, the Virginia attacked a Union squadron of wooden-hulled vessels in Hampton Roads off the Virginia coast. The USS Congress, a frigate, and the USS Cumberland, a sailing sloop, were easily sunk by the Virginia, which suffered no noticeable damage. Late that night, the USS Monitor arrived in the area. With its deck nearly at the water level, the Monitor had an unassuming appearance, but it was a formidable match for the Confederate ironclad. On March 9, the two vessels engaged each other, and both the Monitor and the Virginia suffered direct hits that failed to penetrate their iron shells. 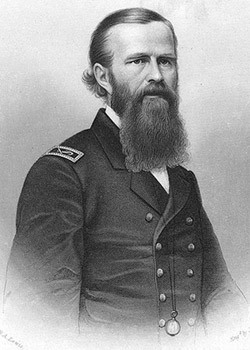 Finally, after four hours, a cannon blast from the Virginia hit the Monitor‘s pilothouse, temporarily blinding the ship’s captain, Union Lieutenant John L. Worden. The Virginia was thus allowed to escape to Norfolk, Virginia, and the Battle of the Ironclads ended in a draw. 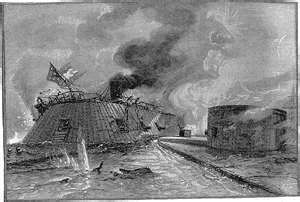 Two months later, the Virginia was trapped in Norfolk by advancing Union forces, and its Confederate crew blew up the fearful vessel rather than allow it to fall into Union hands. During its battle with the USS Monitor the next day, the CSS Virginia sought to employ its ram, not knowing that this weapon now lay at the bottom of Hampton Roads. Before the Civil War, Franklin Buchanan was the first superintendent of the Unites States Naval Academy (1845 - 1847). The stately Buchanan House, current residence of Academy superintendents, is named after this famous Confederate Admiral.